This site includes transcriptions of the diary, correspondence, and papers of the richest and most important man of his day in Virginia, who owned at his death at least 300,000 acres containing many farms and plantations that produced tobacco and other crops for sale, some 750 slaves to work those plantations, and large sums of money invested in Virginia and in England. Robert Carter was a member of the Council of Virginia, acting governor 1726-1727, and a political power in the colony. He had received a classical education in England, and corresponded widely both within the colony and with merchants in England. This site contains transcripts of all the extant Robert Carter texts of which I am aware as of January 13, 2009. I am unable to respond to general or genealogical inquiries about Robert Carter. I would very much appreciate messages about errors found on the site. See "Contact the Editor" in the "Site Directory" below. This page revised November 10, 2015. While interest in making Robert Carter's letters generally available to scholars and the public began in 1938 with the publication of Louis B. Wright's edition of a letter book of Carter's that had strayed west from Virginia to the Huntington Library in California, the present project traces itself to the late 1940's. At that time, more letter books and a diary of Carter's were discovered. Three of the letter books were acquired by the Virginia Historical Society, Richmond, and four letter books and the diary by the University of Virginia Library, They are now held in the Albert and Shirley Small Special Collections Library, University of Virginia. Charlottesville. Francis L. Berkeley, Jr., then curator of manuscripts at the University of Virginia Library, began work immediately on a project to publish these texts. Transcripts were prepared according to the editing principles of the time: punctuation and capital letters were added to sentences, abbreviations expanded, and the like. Mr. Berkeley continued to work on the project until he left the Library to become executive assistant to the president of the University in 1961. One of his plans for retirement was to resume the editorial work which he did after 1974 for several years. Sadly, a progressive eye disease put an end to his dream, and he was forced to turn over to the current editor all of the material he had accumulated over the years. I worked on the project sporadically during a busy career as curator of manuscripts, and later, as the first director of special collections at the University of Virginia Library. As I had written my master's thesis on "King" Carter, and had read all the letters and the diary for that work, I was familiar with the texts. My work has been supported by the University of Virginia Library Faculty Research Committee which provided a number of grants of released time as well as funds for the employment of student assistants. My thanks go to the Committee for its support, and to Sherry Armstrong, Milly Fife, and Susan Garrahan for their cheerful and invaluable assistance. Most important of all was a 1988 grant from the Virginia Foundation for History and Public Policy, to which I also extend my thanks, that grant enabled me to take a semester's leave from my duties at the Library during which I completed new transcripts of the letters to the literal style of today's editorial work, and wrote footnotes for many of the letters. My intent remained book publication for the texts, and I prepared an initial manuscript for the early letters. My interest in computer work and the early development of electronic texts at the University of Virginia Library exposed me to this process, and to HTML and SGML tagging. My membership in the Association for Documentary Editing kept me aware of the work of the Model Editions Partnership whose reports have been particularly helpful. As I approached my own retirement, I decided that I would work immediately on an electronic edition of the Carter texts making use of the facilities and interest of the Electronic Text Center (now Schiolars' Lab) of the University of Virginia Library and its director, David Seaman. After spending some time tagging texts with SGML, David Seaman convinced me to convert to XML, the tagging scheme of the future. It has advantages for me because it allows me to review and correct "finished" texts on my home computer screen without first transferring them to the Library's server. This electronic edition will place Carter's texts before those interested much more rapidly than otherwise, and will add to the body of sources readily available to researchers interested in early eighteenth-century Virginia. The texts consist chiefly of nine volumes of copies of outgoing letters, 1701-1710, and 1720-1732, drafted by one or another of several clerks or occasionally by one of his sons, from Carter's dictation or general directions. In addition there are: a one-volume diary, 1722-1727 with a few days in January 1728, in Carter's hand; a dozen or more recipients' copies of letters; a larger number of nineteenth-century transcripts for letters dated between 1717 and 1719 copied from a letter book not extant as well as for later letters found in the extant letter books; and a few letters addressed to Carter. No texts have been found for 1711-1714, and there are only a few recipient's copies of letters in 1725-1726. Thus, this project deals with texts written out at Carter's direction by a variety of persons in addition to the text of his diary in his hand. Approximately 750 letters survive, and of these, some 700 are drafts found in the letter books. These texts are reasonably easy to read, the major problems coming from the variety of handwritings and styles of punctuation and capitalization of the various clerks with the additional complication of a number of texts available only in nineteenth-century transcripts. The disorder in chronology of the letters is considerable in some of the letter books because the clerks apparently would pick up the nearest book when Carter was ready to dictate. If there is more than one letter with the same date, the letters are in order alphabetically by the recipients' last names. Of the surviving recipients' copies of his letters (generally written out by clerks and signed by Carter), perhaps three or four are duplicated in the letter books. Many of the extant letters are addressed to merchants or other persons in Britain, and Carter followed the colonial practice of sending duplicate letters by different ships. Only one such example survives. The Huntington Library has two recipient's texts of the letter of June 30, 1724, to Colonel William Cage, both of them written by clerks, signed by Carter and sealed with his arms, one sent "per the Princess Carolina, Captain Holladay," and the other "per the Spotswood, Captain Bagnell." The diary covers the years 1722-1727 with a few days in January 1728, and is in very bad physical condition, the edges of many pages having flaked off. It is difficult to read at times due to Carter's carelessness and his habit of abbreviating words. Frank Berkeley wrote of the diary that it is "highly telegraphic in style, almost as terse as shorthand at times in its frugality of expression, and almost totally lacking in punctuation." Carter's spelling was inconsistent at best, and entirely freewheeling at its worst. He was voluble only in regard to his health in this diary, and often frustratingly refers to his "other book" where details of happenings apparently were recorded. The poor physical condition of the diary with its numerous holes and tears in the text have made the use of large numbers of square brackets in the transcript necessary. Two texts are available. In the "Original Spelling" text, the spelling, grammar, capitalization, and punctuation of the original texts have been followed insofar as possible, given the extreme difficulty of duplicating some of the conventions of eighteenth-century handwriting on a computer screen. For "Modern Spelling," software at the Scholars' Lab replaces the original spelling with the modern when that has been indicated in a tag. Superior letters are generally lowered to the line. Clear abbreviations are retained in the "Original Spelling" text, and are expanded in the "Modern Spelling" text..
Square brackets are used to indicate editorial additions such as an expansion of an unclear abbreviation, or a conjectural reading of unclear or missing text. An elipsis inside square brackets is used to indicate text that is present but illegible. The thorn is expanded to "th" in all instances. The various "tailed P" symbols used for "per," "pro," etc., are silently expanded as appropriate. The ampersand is retained throughout. In most cases it has proved possible to read text that was struck through in the draft letters. It has been entered into the transcribed text but tagged so that it shows in red with the word or words lined through. If the deleted text is illegible, it shows in red with the word "illegible" struck through. Dashes used as flourishes and punctuation at the end of sentences are retained. In writing out the drafts of the letters, Carter's clerks frequently placed a dash at a 45 degree angle under the salutation that Carter dictated. These dashes have been converted into dashes following whatever salutation is given. Contracted words over which the clerks placed a tilde or straight line to indicate an expansion was to be made when writing the final draft (a convention of the time) have been silently expanded. Carter's clerks used a stylized abbreviation -- "hhds" -- for the word "hogsheads" in which the tail of the "d" was not only swept up and to the left, as was common at the time, but was then circled down and back across the three letters and down to form the terminal "s." Because this abbreviation seems to incorporate a tilde, the abbreviation "hhds" has been expanded silently when the tilde is present. Carter often dictated postscripts to letters and they are not necessarily found in the letter books beneath the letter to which they pertain. Postscripts are added to the foot of the letter to which they pertain, and the date of the postscript is retained and added to the heading date of the letter. Undated postscripts are added to the foot of the letter to which they pertain if that can be determined. If the letter cannot be identified, the undated postscript is given a tentative date determined by its place in the letter book. Occasionally, Carter wrote a draft of a letter into a letter book, or edited the texts that the clerks had written from his dictation. Such changes from the clerk's to Robert Carter's hand are indicated by the use of italics for Carter's handwriting, and a note is given to alert the reader. All dates are given Old Style (Julian Calendar) but with the year beginning January 1st rather than March 25th; the virgule and numbers for the old year are dropped silently in headings, but are retained at the head of the transcript of the letter or diary entry. Words and phrases written above the line, in the margin, at the foot of the page, etc., that were intended to be inserted in the text, are placed in the text where they belong, displaying in green. In addition, such words or phrases written above or between lines, also display raised above the line. Links to footnotes, the "Brief Notes on Often-cited Persons, Places, and Things in Robert Carter's Diary and Letters," the "Project Bibliography," and other sources are displayed in blue, and are underlined. Clicking on them will take the viewer to the associated text. There are a number of tables in Carter's documents, and the software used for this project forces the use of grid lines in their display although there were none in Carter's originals. Robert Carter lived his adult life in Lancaster County, Virginia, on the southern side of the Northern Neck peninsula, not far from the point at which the Rappahannock empties into Chesapeake Bay, where he was born in 1663 and died in 1732, at the home, "Corotoman," established there by his father. He was educated in England by his father's direction, and acquired a life-long appreciation of books and reading, and the value of a good education. He inherited property from his father, and a sizeable estate on the death of his older half-brother John, but through his own business abilities and the opportunities that he seized, he had acquired well over 300,000 acres of land, some 750 slaves (see the list of the slaves in the inventory of his estate),, and a considerable cash estate by the time of his death according to his obituary in London's Gentleman's Magazine. No other Virginian of his generation was so successful in his political career, in the marriages made by his children, and so ruthless in building his estate for the benefit of those children. He was astute in business, politics, and land speculation, and his fortune, political successes, and estates, vast even in a time of insatiability in land ownership, demonstrate his success. His acute sense of his own importance, and knowledge of the power that his wealth and political acumen had brought him, earned him the derisive nickname of "King,"
His political power was firmly based in the inheritances that he received from his father, Colonel John Carter (c. 1613-1669), from his older half-brother, Lt. Col. John Carter (c. 1648-1690), and from family connections. John Carter, the immigrant, made several voyages to Virginia before establishing himself there permanently between May 1638 and January 1641. Apparently he brought with him useful political connections and considerable money for he soon was chosen burgess for Nansemond River in Upper Norfolk County. But his attention was further north; he acquired land by patent and purchase in what was then Charles River County (to become Lancaster in 1751). Although he appears first in the Lancaster County records in January 1652, he had apparently not yet "seated" his land and had to obtain that April an act of the Assembly for an extension; he moved there soon afterwards. Through his connections and his wealth, John Carter rose quickly to prominence in the colony, and by 1657 he was a member of the council. His five marriages produced only six children, several of whom died in infancy. Most important to Robert was his older half-brother, John, who raised him after their father died in 1669. John Carter I followed the custom of the time in bequeathing most of his property to his eldest son, but he made provision for Robert, leaving him 1,000 acres on a branch of Corotoman, one-third of his personal estate, "his mother's hoop ring & christall necklace," and a sixth part of his books. Most important for Robert were the specific instructions that his father wrote concerning his education. Robert was to have a tutor who would teach him both English and Latin. John Carter II, who was about fifteen years older than his brother, obeyed their father's instructions, and furthered them by sending Robert home to England for higher education. The custom of the time was that boys were sent to England when they were nine or ten, and Robert probably sailed to England about 1673. From a letter of Robert's written late in his life when he was quarreling with his English factor, William Dawkins, over the education of his own sons and grandsons, we know that he spent at least six years in England, living in the home of merchant and family friend, Arthur Bailey, and learning from him, and from the opportunities presented by living with the merchant, much of the tobacco trade and its marketing end. Robert's education in England undoubtedly included thorough grounding in the Christian religion. Most of his schoolmasters would have been clergymen, and would have considered religious education a fundamental requirement of their curricula. While Robert always considered himself "of the Church of England way," he was not intolerant of dissenters, and Louis B. Wright has written in several places of the books by Puritans and others in the libraries of both John Carters which Robert would have had access to before and after his years in England. He would purchase titles on religious subjects for his library, which included the books that he inherited from his brother and father, through the rest of his life. Robert returned to Virginia about 1680 to take up the life of a Virginia gentleman on the modest estates he had been left by his father. He built a house on the home property at "Corotoman," however, a brick story-and-a-half structure of three rooms. He lived in it until he moved into the larger two-story mansion which dominated the Corotoman landscape for a decade beginning about 1720. John Carter II continued much of the service and prominence that his father had established as the norm for the family. He is referred to as captain at first, but by 1672, his rank is that of lieutenant colonel, a title, presumably from his militia service, that he is accorded until his death.. He served as sheriff in 1673 and again in 1678, burgess, and at other times, he was collector of the levy. Unlike his younger brother, John Carter II was not obsessed with the acquisition of land. Checks of the land office records do not show that he took out any patents. Apparently running his farms successfully, raising his brother, and being active in county affairs were sufficient for him. He married first Elizabeth Hull prior to 1675 when he is named in the will of his father-in-law. This marriage produced one daughter, Elizabeth, who was to marry John Lloyd in 1693. Elizabeth Hull Carter was dead by 1684 when Lancaster records mention a marriage between John Carter and Elizabeth Travers who outlived him to marry Christopher Wormeley, dying herself in 1693. By 1688 it was apparent that John Carter's principal heir was to be his brother, and this greatly improved the latter's prospects. Robert was married in that year to Judith Armistead, daughter of John Armistead of "Hesse," Gloucester County; their son, John, was born about 1689, and four other children followed, Elizabeth in 1692, Judith and Sarah who died in infancy, and a second Judith in 1695. Because no letters or other texts survive from this period of his life, little is known about his wife, or the early years of his children, but presumably the traditional Virginia custom was followed in raising and educating the Carter children. Having renounced the carefree life of the bachelor, Robert was considered ready for the types of public service that his father and brother had undertaken. Robert's first position was that of justice of the Lancaster Court, an office for which he took the required oaths on 10 June 1690. Election as a vestryman for Christ Church Parish followed on 8 November 1690; about a year later he was chosen church warden, a position he retained until his death. And service to the colony soon ensued with his election as burgess for the session beginning 1 April 1692. He was returned to every session of the Burgesses until 1699 with the exception of the two sessions held in 1693. As chairman of the Committee of Propositions and Grievances in 1695, Carter steered the members to present a protest against the actions of the Northern Neck proprietary agents, and the proprietary itself. This was his last effort of this sort because the appeal of acting as Virginia agent for the proprietors was soon to bring him over to their side. He took a leading role in the work of the House, and "in September 1696 Carter was elected Speaker over five other nominees. Carter was not chosen as Speaker for the 1698 session, but was in April 1699. Also at this session, the House chose Carter as Treasurer of the colony, an office which, as Jon Kukla has observed, was one usually associated with the Speaker. However, the House took the most unusual step of allowing Carter to retain the office of Treasurer even after his appointment to the Council was confirmed in England by the Privy Council on 14 December 1699. There is no indication in the surviving records that Carter had any formal training in the law, but he was interested in it. Most planters of his day found it necessary to learn something of the law because many served as justices. Service in the House of Burgesses, particularly assignment in 1695 to serve on a committee to revise the laws of the colony as the Board of Trade had ordered, may have spurred Robert Carter's interest. By the time of his death, he had about 100 law books in his library, more than one-third of its total. 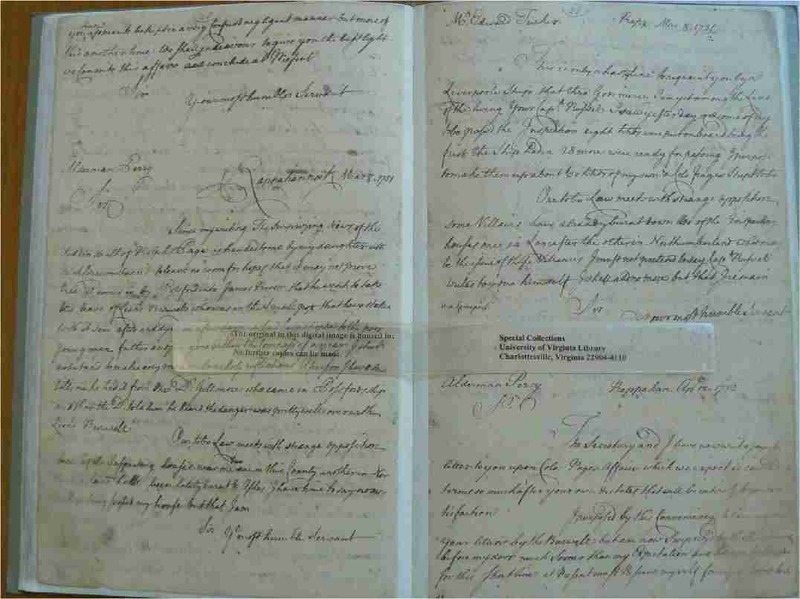 He never hesitated to include references to the law in his letters. By 1701, when the first of the extant letters was written by Robert Carter, he was already one of the most prominent men in the colony as a member of its council, and the significant events of the early portion of his life had occurred, including the death of his first wife in 1699 and his second marriage (to Elizabeth Landon Willis, by whom he would have ten children) in 1701. The letters dated between 1701 and 1710 included in this project reflect little of Carter's personal, political, and mercantile interests of that time because they are ones he wrote as one of the trustees of the children of his friend, Ralph Wormeley, and deal with their affairs rather than his own. There are a few that step outside his duties to his friend, and they show his interest in land acquisition, a topic that would occupy him all of the rest of his life. There is little extant on his first term as Virginia agent for the proprietors of the Northern Neck, an arrangement of importance to Carter because it gave him a taste of how profitable that office could be. A separate section of this project concerns Carter's work as the proprietor's Virginia agent. There are no extant texts for the years 1711-1714, one in 1715, none in 1716, and a few for the years 1717-1719 from various sources including some nineteenth-century copies made from a letter book no longer extant. Beginning with the year 1720 and continuing until Carter's death in August 1732, the record is fairly full, and a good picture of his management of his affairs, political interests, and daily routines can be drawn. The most important events of the last twenty-two years of his life were to be his term as acting governor of the colony after the death in July 1726 of Hugh Drysdale until the arrival of William Gooch in September 1727, and his second term as agent for the proprietors of the Northern Neck. By the time that Carter became acting governor, he was in his sixties and in poor health. His extant diary, kept between 1722 and 1728, gives information his concerns while tantalizing with references to his "other book" in which he apparently wrote more detailed entries. His drive to acquire land for his children led him to acquire in 1720 a lease of the propriety from Lord Fairfax, and to take patents on huge quantities of land moving ever westward in Virginia with his acquisitions. It is in his management of his highly successful agricultural operations and in his operation of the proprietary that our interest in him lies. The hundreds of letters that he wrote in this period and the one extant diary provide a wealth of information for those interested in Virginia in the early years of the eighteenth century. Management of his farms occupies much of Carter's time and his writings. The majority of his letters are written to British merchants consigning tobacco for sale, ordering goods for his family, servants and slaves, and the like, but as many of the merchants were at least old friends, there are frequent comments about Virginia events and people. Carter orders clothes, books, and newspapers for himself, writes about his poor health, and seeks favors ranging from wine to offices for his sons. Robert Carter was influential in his own day and left a family dynasty that continues to this day. At one time, he was estimated to have over 50,000 descendants including six governors of Virginia, three signers of the Declaration of Independence, and two presidents of the United States. Five sons and five daughters survived to marry well and were themselves prolific. His letters and other writings reveal his drive to establish this dynasty, and the skill and intelligence he brought to this effort. Details of the early Carter genealogy are to be found in Christine Jones, John Carter I of "Corotoman" Lancaster County, Virginia. (Irvington, Virginia: Foundation for Historic Christ Church, Inc., 1977). Details of Carter's wives, children, and descendants may be found in Florence Tyler Carleton, compiler. A Genealogy of the Known Descendants of Robert Carter of Corotoman. (Irvington, Virginia: Foundation for Historic Christ Church, Inc., 1983). One letter book of Carter's has been published: Louis B. Wright, Letters of Robert Carter 1720-1727: The Commercial Interests of a Virginia Gentleman (San Marino, CA: Huntington Library, 1940). Wright also wrote of the Carters' libraries in "The "Gentleman's Library" in Early Virginia: The Literary Interests of the First Carters," (Huntington Library Quarterly, I (1937), 3-61). His schooling in England has been covered very well by Alan Simpson in "Robert Carter's Schooldays" , an article in the Virginia Magazine of History and Biography (94[April 1986]: 161-188). And Jon Kukla in Speakers and Clerks of the Virginia House of Burgesses, 1643-1776 (Richmond: Virginia State Library, 1981) gives the details of Carter's career as a burgess and council member. Lloyd T. Smith, Jr.'s, detailed study of Carter's will is also very useful: Robert Carter of Corotoman 1663-1732: An Analysis of His Last Will and Testament. (Irvington, VA: Foundation for Historic Christ Church, 2009.) Smith's equally detailed study of the letter book of Carter's executors is a wwelcome addition: The Executors' Letters of Robert Carter of Corotoman, 1732-1738. [Irvington, VA: Foundation for Historic Christ Church, 2010]. Fairfax Harrison's monumental study, Landmarks of Old Prince William (Berryville, Va.: Virginia Book Company, 1964, a one-volume reprint of the 1924 two-volume edition) remains invaluable for its detail about the development of that area of Virginia and the proprietary. There are numerous references to Carter and others of his period in Earl G. Swem's Virginia Historical Index which indexes a half-dozen publications on Virginia history and genealogy. On September 18, 1649, British King Charles II gave a patent for a large section of Virginia between the Rappahannock and Potomac rivers, extending west to the heads of these rivers, to seven of the loyal followers who were in exile with him. The lands conveyed in this patent, known as the Northern Neck Proprietary, were to involve Robert Carter heavily during two periods of his life, and the second of those periods was to provide him with an opportunity to build the fortunes of his family in a way unprecedented in Virginia. There were problems with the Proprietary from the beginning. These included the actual scope of the patent since Virginians and those in England defined the heads of rivers by different standards. Collecting quit rents (taxes) from settlers in the Proprietary was very difficult as was the enforcement of other rights exercised in such royally-granted areas. By the turn of the eighteenth century, control of the Proprietary had come to one man, the fifth Lord Thomas Fairfax who also inherited a new patent issued by King James II in 1688 which established the western limits of the Proprietary as the "first heads or springs" of the Potomac and Rappahannock rivers, meshing it nicely with southern border of the Maryland Proprietary to the north. While some of the original proprietors' rights had been lost, the collecting of quit rents from settlers had been established through the efforts of their agent in Virginia, William Fitzhugh, and through Lord Fairfax himself who persuaded "Richard Lee, a large and widely respected Northern Neck landholder, to make quit rent payments to the Proprietors." ( Brown, p. 37. ) This ensured that the proprietors received income from their property in Virginia, and made it extremely valuable to them. William Fitzhugh died in October 1701 and George Brent had died several years earlier. Lord Fairfax approached the great London merchant, Micajah Perry, widely acknowledged to be extremely knowledgeable about Virginia for which he had been agent, for advice about a new agent in the colony. Perry recommened Robert Carter, and he was accepted. After Lord Fairfax died in January 1710, his son inherited the title and his five-sixths shares in the Northern Neck. In May, his grandmother died leaving the new Lord Fairfax her one-sixth share. However, because he was only sixteen years old, the affairs of the Proprietary fell to his mother, Lady Fairfax. She had advisors, including merchant Thomas Corbin, who counseled her that the return from the Virginia lands was too low and that she should try a new arrangement. A lease for a period of years paying about £425 per year was negotiated in 1711 or 1712 with Virginia council member Edmund Jenings (Corbin's brother-in-law), and Corbin's nephew Thomas Lee was appointed Jening's deputy. As Jenings, deep in debt and poor in health, remained in London for some time, it was Lee who opened the new Proprietor's office in Virginia. Jenings returned to Virginia in the winter of 1716 and resumed his seat on the Council. His debts had become severe, and his payments to Lady Fairfax for the lease of the Proprietary lagged badly. Thus, when she died in 1719, leaving only a life interest to her five-sixths of the Proprietary to her twenty-six-year old son, and naming a distant cousin, William Cage, as trustee of her estate. Cage, fortunately for Robert Carter, consulted Micajah Perry about a new lessee for the Proprietary, and Carter and Perry negotiated a lease on much the same terms as Jenings had had. One cannot understand Robert Carter without knowing something of the Northern Neck Proprietary and his relationship to it. Many of the letters written during the period 1720-1732 (that of the bulk of his exatant papers), contain references to his interest in land and its acquisition. Carl F. Canon. "Robert ( 'King' ) Carter of 'Corotoman.'" Duke University thesis, 1956. Freeman, Douglas Southall, George Washington, A Biography. (New York: Scribner's, 1948). Vol. 1. See Apprendix I, "The Northern Neck Proprietary to 1745," pp. 447-525, for an excellent discussion and the text of the first patent (pp. 513-519) issued by Charles II. Brent Town was a speculative land development put together by Nicholas Hayward (d. ante 1697) of London, a notary public, merchant, and speculator. Hayward assembled a syndicate composed of London merchants Robert Bristow (1643-1707) and Richard Foote (his brother-in-law), and George Brent of "Woodstock," Stafford County. The syndicate purchased on January 10, 1686/87, from Lord Culpeper, by then the controller of the Northern Neck Proprietary, 30,006 acres in Stafford County "Between the Courses of the said Two Rivers, Rappahannock and Potowmack . . . upon and Between the Southwest and Northeast Branches of Ocaquant Creek. . . ." Hayward obtained a dispensation from King James II that would allow the Hugenots that he hoped to settle on the land to have "the full exercise of their Religion." The town that Hayward hoped to build on the tract was called Brenton, "but this was corrupted by local [Virginia] usage into Brent Town, and that came to be the designation of the whole tract." Hayward was not successful in persuading Hugenots to move to the lands, and, after flirting with other possibilities, the tract remained unsettled and unsurveyed at the time of his death about 1697. The members of the syndicate and their heirs bequeathed and sold their rights in the Brenton tract for generations. Robert Carter was to have considerable trouble over the tract after becoming leasing the Proprietary in 1721. He was pressed to grant lands in the area of Brenton, but it was very difficult to do so because the tract had not been formally surveyed. Carter quietly had a survey made, and used it to grant lands outside what he considered the Brent Town grant to be, but a formal survey was not made until 1737-1738. Fairfax Harrison, in a chapter entitled "Brent Town, Ravensworth and the Hugenots," in his Landmarks of Old Prince William (from which all quotations used here are taken) tells the story of Brent Town extremely well. See also Davis, William Fitzhugh, p. 191, fn 2, and other sources. The earliest letters of Robert Carter's that have been located -- fifty-three items dated between 1701 and 1710 -- concern the estate of his brother-in-law, Ralph Wormeley (1650-1701), member of the Council and Secretary of State of Virginia, who lived in very grand style at "Rosegill" Middlesex County , on the Rappahannock River. Carter had married Judith, and Wormeley Elizabeth, the daughters of John Armistead of Gloucester County . Wormeley, second of that name in Virginia, left two sons, Ralph (ca. 1681-1714) and John (1689-1727), and named them his executors. Because his sons were minors at the time of his death, his "dear friends and relations," Edmund Jenings , Robert Carter, Thomas and Gawin Corbin , and Edwin Thacker , who were asked in Wormeley's will "to aid and assist" his sons in their duties, actually assumed control of the estate. All the trustees were planters but Thomas Corbin who had become a merchant in London. Carter was responsible for the Wormeley estates on the Rappahannock while Jenings supervised those on the York River near his home, "Ripon Hall." Personal relationships between Wormeley's "dear friends" were complicated. Wormeley and the Corbins were first cousins as their mothers were sisters, Alice and Agatha Eltonhead. A third Eltonhead sister, Eleanor, was Robert Carter's father's second (of five) wife. Gawin Corbin was also Wormeley's son-in-law, having married his daughter Katherine. Edmund Jenings was married to another daughter, Frances. Edwin Thacker was a cousin of Wormeley's through the Eltonheads. Extracts from Carter's letters concerning the estate were published in the William and Mary Quarterly in 1909,and were mentioned in an earlier article in the Virginia Magazine of History and Biography. Both articles referred to the volume containing the originals as one used chiefly to record processioners' returns for Christ Church Parish, Lancaster County; the volume was then in the Lancaster County courthouse. Robert Carter was a vestryman of this parish and apparently had custody of the volume. Care of his friend's family would have been a religious duty to Carter, and he had his clerks use the volume to record copies of his letters concerning the Wormeley estate. The volume was located in Archives Research Services, Library of Virginia, Richmond, where it is described as: Church Records, Christ Church Parish, Lancaster County, Processioners' Returns, 1711-1783, and Wormeley Estate Papers, 1701-1710 (Acc. No. 30126).